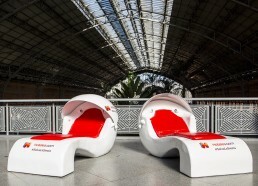 Working with Hotels.com and One Green Bean we designed and built two unique siesta pods that were placed in Madrid at the Atocha station. These pods were part of a campaign to have the siesta and received a lot of attention in the spanish press. Our pods were uniquely designed, hand made and had unique colour changing retractable visors and music.